Photo by Scully Photography. Students from the Biology 118/318 class pose for a photo with their guide Emile Serrette (bottom left), Assistant Professor Jon Wilson (standing, far left), and the CPGC's Stephanie Zukerman (crouched, center) after visiting the San Antonio Green Market in Trinidad. Assistant Professor Jonathan Wilson's "Economic Botany" course was already a unique experience. Bringing together 100-level students and 300-level biology majors, the class is a multidisciplinary exploration of the co-evolution and co-domestication of plants and humans. With Michael Pollan's The Botany of Desire as a guide, the environmental biologist and his 18 students examine case studies of sugar, chocolate, bananas, tea, citrus, and coffee, among others, as a way to appreciate the complex, and intertwined, histories of humankind and plants. But for 10 of Wilson's students, "Economic Botany" also took them on the adventure of a lifetime. Thanks to a collaboration between the Center for Peace and Global Citizenship and the Koshland Integrated Natural Sciences Center, more than half of Wilson's 18-person class were selected, via a rigorous application process, to spend spring break in Trinidad and Tobago on a field study tour, experiencing firsthand the plants they studied in the classroom flourishing in their natural habitats. "The main learning goal for the course is to get students to understand the botanical, social, and cultural history of the food and the plants they learn about," said Wilson. "It’s looking at the history of humans domesticating plants, but also plants domesticating humans to spread themselves around the globe because they’re useful to people as food, as clothing, as fibers. But there’s a practical, hands-on type of learning from being ankle-deep in the mud on a trail going through a cacao grove. The knowledge and insight you get from that experience is complementary to what you learn in a lecture or from reading a book." The trip was a result of a personal collaboration between CPGC Program Manager Stephanie Zukerman and Wilson that brought together Zukerman’s intercultural expertise and local contacts with Wilson’s tropical botany experience. Wilson, his 10 Bi-Co students, and Zukerman departed from New York's JFK Airport on March 3, for a nine-day stay on the islands that included visits to the San Antonio Green Market, a hummingbird sanctuary, renowned nature preserve Asa Wright Nature Center, and two cacao cultivation facilities. The group hiked in rainforests—both during the day and at night—enjoyed world-famous bird-watching, and were overwhelmed with the biodiversity they got to view up close. "There is something magical about falling asleep to torrential rain and waking up to a cacophony of tropical bird calls," said Gabriel Oppler '17, a biology major who is conducting his senior thesis research in Wilson's lab. "Sure enough, my favorite part was waking up at 5:30 a.m., before the sunrise, to watch as bats, then hummingbirds, then larger birds flocked to the veranda at Asa Wright Nature Center. I had my trusty camera around my neck and coffee in my hand and, along with my classmates, sat still and silent for two hours as nature woke up around us." "In class we've talked extensively about the cultivation and processing of crops such as cacao and coffee, [and] to see these plants in person and follow along the various steps of production enriched what we'd learned in class to a great extent," said biology major Charles Hale '17. "It's one thing to read about how chocolate is made; it's an entirely different entity to go to a place like Brasso Seco and crack open cacao pods from trees and 'dance' on the dried beans before tasting the finished product later on." The CPGC's Zukerman, whose family hails from Trinidad, travels to the islands annually and is currently conducting research for a master's thesis on ethnic relations in the region. She spent a year planning the study trip with Wilson, taking advantage of her island contacts to offer the students unparalleled access to local guides and academics and even discounts at a breathtaking eco-resort in the rainforest. Because of her CPGC work and her history with the islands, her role, as she saw it, was to make sure the students experienced the local culture, which dramatically impacted their understanding of the local plants. "When you’re studying conservation and ecology [in a place], you have to learn the local culture and how their society understands these things and what the power dynamics are," said Zukerman. "Almost every local who spoke with us started off with the history of Trinidad and Tobago, including its history of slavery and indentured servitude. It’s a living history for them as a post-colonial society." 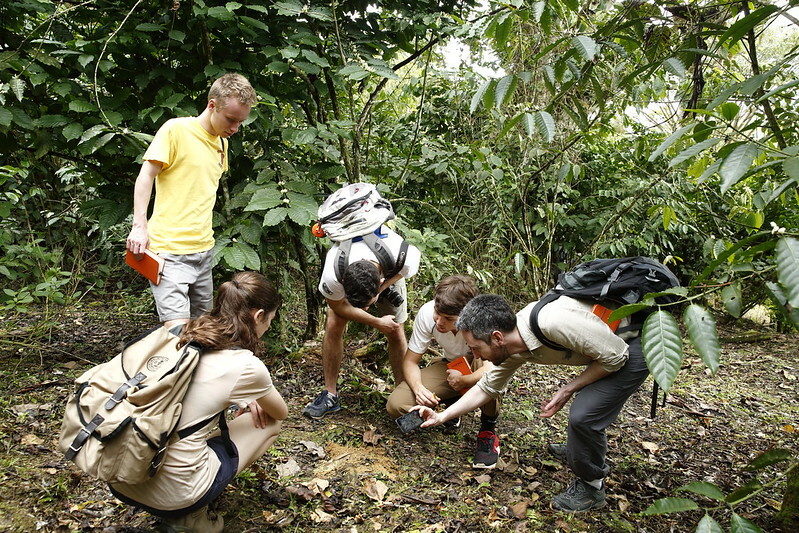 Through Zukerman and Wilson’s collaboration on cultural and scientific topics, over the course of the field study trip, students gained not just hands-on experience with the tropical flora and fauna but also an understanding of the history of the islands and how that affects the plants and people. "A story we were told many times over was the story of how sugar cane fueled the importation, first of slaves from Africa, and then of East Indian indentured laborers," said Alana Tartaro '17, a psychology major and environmental studies minor. "This story of the way a tropical plant, because it was desired by people who could not grow it in their climate, took over a country and forced people into slavery is a common narrative in our class." Because Wilson's course includes students from across the disciplinary spectrum—including comparative literature majors, social scientists, and fine artists—each person's takeaway was different. Though every student expanded their biology and botany knowledge, some were more affected by what they uncovered about the globalized food industry, the history of the islands, the local agricultural economy, or the sights and sounds of the diverse tropical ecosystem. "The things I remember most vividly are tastes and textures," said Tartaro. "I remember the taste of the pulp of cacao fruit, the feel of tropical rain, and the smell of fresh nutmeg." "The students were engaged the entire time," said Zukerman. "They were filling their journals with notes, sketching plants. It was a thrill to see how engaged they were and how much they learned." For Wilson, the trip reached its zenith during a pair of rainforest hikes, in less than perfect weather, on the trip's last day. Not only did those hikes perfectly illustrate the differences between an untouched "primary-growth rainforest" that had been preserved since 1776 and the "secondary rainforest" that had once been partially logged, but they also proved that the students—even the non-biology majors or scientists—had synthesized all of the course information Wilson had been presenting and understood it in a sophisticated way. "The non-majors began to ask advanced questions along with the science students," he said. "Having that moment on the hike was everything I hoped the trip would be. The students achieved a depth of understanding that was really advanced, and that made me very proud. And the students were so tough and Haverfordian about [the experience]. It was pouring rain that day, but they were smiling and laughing." The spring break trip offered Wilson's students an opportunity for experiential learning—a chance to amplify and emphasize his course content in a real-world setting. The 10 students who made the more-than-2000-mile trip brought a Haverford classroom to the tropics, and, more importantly, they brought the myriad lessons learned in Trinidad and Tobago back to campus with them, changing the course of their semester and perhaps even their futures. "Without a doubt, the trip helped confirm that my life after graduation will involve, at least at some point and to some degree, work in tropical ecology and conservation," said Oppler. "I'm confident that I'll return to the tropics and continue to learn and work to protect the unique ecosystems there." "The most important thing I learned is how to see differently," said anthropology major and health studies minor Ellie Greenler '17. "I learned how to look at a vast wall of green rainforest around me and pick out key characteristics of the plants that help me gain information about them. Suddenly the wall stops being just a wall and starts being an array of lycophytes, epiphytes, bryophytes, and ferns. … The ideas that we talked about in class were talked about again in Trinidad and Tobago, but, more importantly, they were seen."